Update on 9/29/16: File Cabinet Pro is now also available on the Mac App Store. The information provided in this post is now outdated. You can view the original post below. 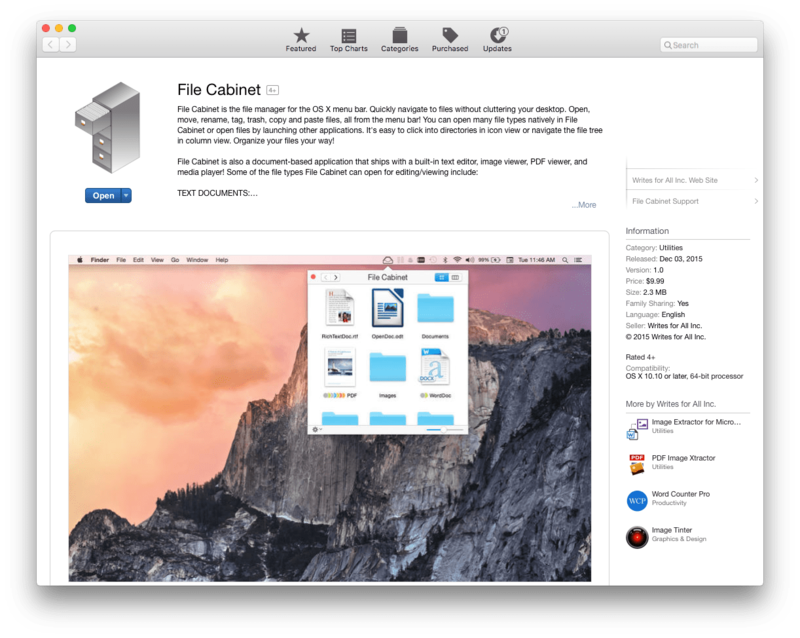 File Cabinet on the Mac App Store. File Cabinet has been released on the Mac App Store. As you may already know, we have been selling File Cabinet Pro here at AppTyrant dot com since late September. Before you purchase either version of the app, you should be aware of the differences between the Mac App Store version and the non-Mac App Store version. The Mac App Store version is being sold at a lower price than the Pro version because the Pro version has more features. Mainly, File Cabinet Pro allows you to set up a folder in iCloud Drive, but File Cabinet on the Mac App Store does not support iCloud at all. Update on January 10th, 2016: Starting in version 1.5, you can now change the local directory File Cabinet displays in both the Mac App Store version and the Pro version. The paragraph below no longer is true. Also, File Cabinet Pro’s local folder lives inside your Documents folder on your Mac, while File Cabinet’s local folder lives within a specialized Documents folder that OS X gives sandboxed apps by default. The Documents folder OS X gives Sandboxed apps by default is not user-facing in the Finder (it is within ~/Library/Containers/com.Writes-for-All-Inc.Junk.Drawer/Data/Documents/File Cabinet). However, you can easily navigate to the Documents folder in the Mac App Store version by right-clicking on a file in File Cabinet’s user-interface and selecting “Show In Finder” in the pop up menu. Finally, File Cabinet Pro receives updates faster than the Mac App Store version because we do not have to wait for App Store approval. 1) You don’t plan on using iCloud Drive. 2) You like updating your software through the Mac App Store. 3) The Mac App Store version is cheaper and you want to save some bucks. The chart below highlights the main differences between File Cabinet Pro and File Cabinet.